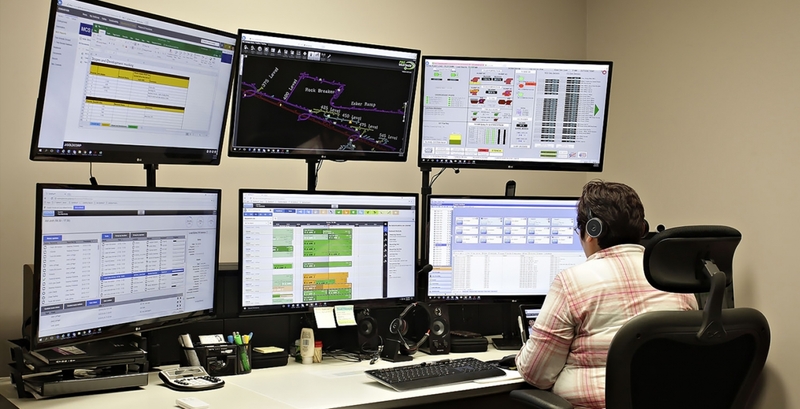 After years of relying on a manual paper-based system and radio communications to relay vital information to underground equipment operators, Ontario’s Musselwhite mine recently implemented a digital fleet management system for underground vehicle dispatch that helped improve productivity and enhanced safety. “The previous process was very static,” admitted Neil Moloney, Manager, Digital Transformation. Instructions were initially provided to equipment operators during the morning huddle, but during the shift when situations changed a considerable amount of written and radio communication was required to redeploy trucks or resolve outstanding issues. The potential for miscommunication was high, resulting in inefficient truck utilization and excessive idle time. Following a thorough evaluation, the team selected and customized Sandvik’s OptiMine software system based on employee feedback to meet the immediate needs of the mine. The small core team presented the OptiMine system to senior management and received the green light to present the proposed system to employees. The system also provides real-time production reporting, maintenance scheduling, and plan versus actual result reconciliation. In addition to streamlining communications, the ability to track direct loaded and unloaded haul trucks and other vehicles on the ramp has also helped improve safety. Productivity has improved significantly with approximately three more trucks per day being loaded at the end of each shift. In Q2-2018, phase two of the OptiMine implementation will get underway with the addition of bolters, drills and maintenance vehicles at Musselwhite. This phase will also include the addition of a 3D visualization component providing a three-dimensional view of the mine. Plans are also underway to roll OptiMine out at other Goldcorp operations later this year.